KIEV, Ukraine -- President demands justice for the 298 killed when their plane was shot down over eastern Ukraine three years ago. 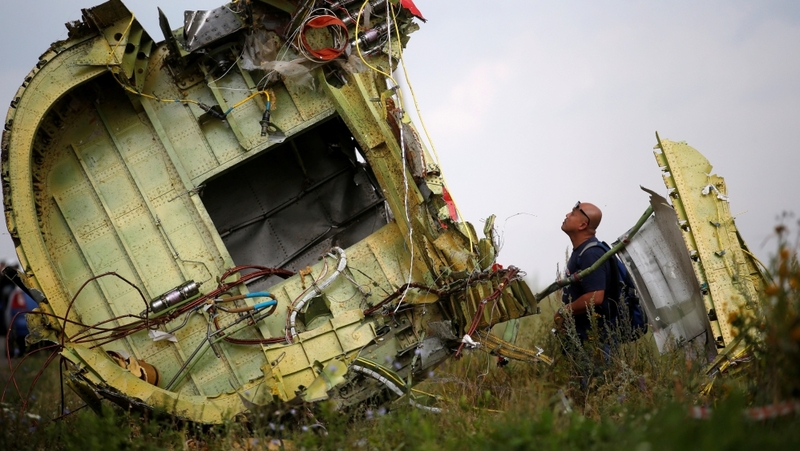 All 298 people aboard Malaysian Airlines flight 17 were killed when the plane was brought down on July 17, 2014. Ukrainian President Petro Poroshenko says Russia must be held to account over the downing of Malaysia Airlines flight MH17, three years after the tragedy that killed 298 people. International investigators have said the Boeing jet flying from Amsterdam to Kuala Lumpur was shot down over war-torn eastern Ukraine on July 17, 2014 by a Russia-supplied missile system that was fired from territory held by Russian-backed fighters. The probe being led by the Netherlands - which suffered the majority of losses - is focusing on some 100 people suspected of having played an "active role" in the incident, but the investigators have not publicly named any suspects. Ukraine has said that all the evidence points to the anti-government fighters and Russia. Russia and the anti-government groups it supports, however, have denied any involvement and have blamed Ukraine. Poroshenko called the incident a "barefaced crime" in a Facebook post on Monday, marking the third anniversary of the tragedy. "It was a barefaced crime that could have been avoided if not for the Russian aggression, Russian system and Russian missile that came from Russian territory," Poroshenko said. "Our responsibility before the dead and before future generations is to show to the aggressor terrorists that responsibility is unavoidable for all the crimes committed." Officials announced this month that the trials of any suspects arrested over the shooting down of MH17 will be held in the Netherlands. Poroshenko said that he was "convinced that the objectivity and impartiality of Dutch justice will complete this path". No official events were planned to mark the anniversary but local residents gathered for a small religious ceremony at the crash site outside Hrabove village in Donetsk region which is held by anti-government fighters. In the Netherlands, thousands of relatives and friends gathered on Monday to unveil a "living memorial" near the Amsterdam airport from which the plane departed. In Malaysia, Dato Sri Liow Tiong, the transport minister, promised justice for the victims. "Three years may have passed, but the memories of the passengers and crew on-board will always be with all of us and they will be remembered dearly. Ten nations have also lost sons and daughters to this tragedy," he said in a statement on Monday. Russia and Ukraine have been locked in a bitter feud since Russia annexed Crimea in March 2014. Fighting then broke out between pro-Russian fighters and Ukrainian government forces in a conflict that has cost the lives of more than 10,000 people.